Natural baltic amber. Competitive price & good quality. 12,95gr. Large Amber Pendant, royal baltic, EGG YOLK, butterscotch color, genuine amberstone, sterling silver, unique-handmade, amber gift. 15,95gr. Large Amber Pendant, royal baltic, EGG YOLK, white color, genuine amberstone, sterling silver, unique-handmade, amber gift. Baltic Amber Ring, Genuine Amber Ring, Egg Yolk color amber ring, natural amber & sterling silver, natural amber gift. 19gr. Big Amber Pendant, baltic amber, genuine amberstone, stone handmade, butterscotch & white amber, large amber, amber gift. 10,83gr. Natural Baltic Amber Pendant, EGG YOLK color, sterling silver, genuine amberstone, amber gift, handmade. 19,85gr. BIG Baltic Amber Pendant, cogniac color, genuine amberstone, sterling silver, handmade, cogniac amber pendant . 14,30gr. Large Baltic Amber Pendant, butterscotch color, genuine amberstone, unique-handmade, amber gift. Vintage Baltic Amber Ring, Genuine Amber Ring, Butterscotch color amber ring, natural amber gift. 18,7gr. BIG Baltic Amber Pendant, butterscotch color, genuine amberstone, unique-handmade, amber gift. 17gr. Natural Amber Bracelet. Genuine baltic amber. Amber healing bracelet! Raw therapeutic amber stones! For adults & teens. 27gr. Natural Amber Bracelet. Genuine baltic amber. Amber healing bracelet! Raw therapeutic amber stones! For adults & teens. Natural Amber Bracelet. Genuine baltic amber. Amber healing bracelet! Raw therapeutic amber stones! For adults & teens. Baltic Amber Ring, Genuine Amber Ring, Butterscotch color amber ring, raw amber & sterling silver, natural amber gift. Baltic Amber Ring, Genuine Amber Ring, Butterscotch and green color amber ring, raw amber & sterling silver, natural amber gift. Baltic Amber Ring, Genuine Amber Ring, Egg Yolk color amber ring, raw amber & sterling silver, natural amber gift. 3,55 gr. Baltic Amber Pendant, egg yolk color, genuine amberstone, sterling silver, handmade, amber gift, yellow stone, amber jewellery. 3,45 gr. Baltic Amber Pendant, egg yolk color, genuine amberstone, sterling silver, handmade. 24gr. Natural Amber Bracelet. Genuine baltic amber. Amber healing bracelet! Raw therapeutic amber stones! For adults & teens. 4,25 gr. 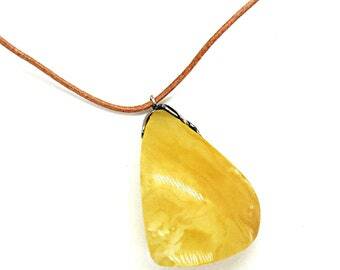 Baltic Amber Pendant, butterscotch color, genuine amberstone, sterling silver, handmade.